Nostra Terra (AIM:NTOG) (“Nostra Terra”) (“the Company”), the oil and gas exploration and production company with a portfolio of assets in the USA and Egypt, is seeking to raise between £260,000 in a placement priced at 2p per share, through the Teathers App. Placement participants will receive a warrant (1 warrant for every 1 shares subscribed for), exercisable at 3p per share. The warrants last for 1 year (12 months) from issue. 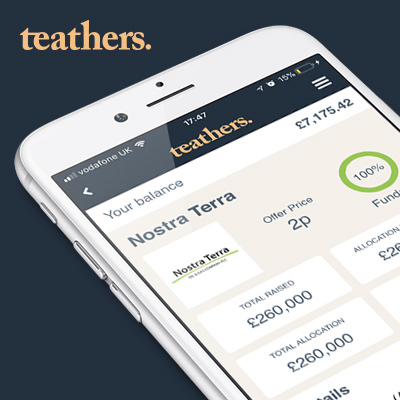 Immediately prior to launching the offer on the Teathers App, Nostra successfully raised a further £260,000 in a separate placement. Proceeds from the placing will go towards further acquisitions, work overs, and drilling of new wells across the Company’s portfolio. 87.5% working interest (“WI”) in the Pine Mills oil field, Texas. Nostra Terra expects to acquire the full 100% WI in Pine Mills in the coming weeks. 57.2% to 75% WI in leases in Mitchell County, Texas, covering the Permian Basin. 50% ownership of Independent Resources (Egypt) Limited, a Joint Venture with Independent Resources (AIM:IRG), which owns a 50% stake in the East Ghazalat Concession, Egypt. Nostra Terra’s strategic focus is on securing cash generative, conventional oil producing assets, which primarily include operations. However, Nostra Terra expects to broaden its acquisition criteria in 2017 to include projects with more exploration potential, in the interim the focus is on securing assets, which can make an immediate contribution to the bottom line. Nostra Terra secured an 80% WI in Pine Mills on 29 November 2016 for $1,025,000. On completing the acquisition, Nostra Terra became operator of Pine Mills, backdated to 01 November 2016. On 26 January 2016, Nostra Terra announced it had secured an additional 7.5% WI in Pine Mills for $200,000. As part of this transaction the Company also inherited a Texan Court Judgement, non-appealable, in favour of Nostra Terra, which will see it either receive $426,322 cash or the remaining 12.5% of Pine Mills plus the residual cash balance. A recovery action is in motion concerning this. Average production at Pine Mills has been c.100 barrels of oil per day (gross) in the last 6 months. Nostra Terra has initiated a cost cutting programme at Pine Mills to improve operational efficiency. Production at Pine Mills is profitable below $30 a barrel of oil. The independent assessment of Pine Mills assigned a $3.53million NPV10 valuation to Nostra Terra’s 87.5% WI here. Potential exists at Pine Mills is to increase gross production to 150bopd through reactivation of existing drilled wells, development drilling of proven locations and exploration drilling. On 03 November 2016 Nostra Terra bought a 57.2% WI in 4 wells located on 50 gross acres of the Permian Basin, Mitchell County, Texas for $62,500. The leases produce conventional oil, at shallow depths. Production is profitable below $30/barrel. On 23 February 2017 Nostra Terra bought a 75% WI in leases which contain18 drill locations and 9 existing wells for $60,000. The leases are across 200 acres of the Permian Basin, Mitchell County, Texas. Nostra Terra has initiated work over programmes at its Permian Basin Assets. The independent assessment of Nostra Terra’s Permian Basin Assets assigned a $1.04million NPV10 valuation to them. Nostra Terra will continue to perform further work overs and reactivations of existing drilled wells to take place in 2017. New wells may also be drilled to improve overall production and increase reserves. Nostra Terra owns 50% of Independent Resources (Egypt) Limited, a Joint Venture with Independent Resources (AIM:IRG), which owns a 50% stake in the East Ghazalat Concession, Egypt. The Joint Venture secured the early repayment of the outstanding $2.5million loan note, with TransGlobe Petroleum International, for $200,000. As a result, the total price paid by the Joint Venture for the 50% stake in the East Ghazalat Concession was $1.2million ($1.19 per barrel of oil). The effective date of the initial transaction was 01 July 2015. Gross 2P reserves at East Ghazalat attributable to the Joint Venture are 1,008,922 barrels of oil on 30 June 2015 (DeGolyer and MacNaughton Canada Limited estimate). Revenues have been accruing to the joint Venture, but the Company has yet to receive any cash value. Nostra Terra and Independent Resources remain in discussions with East Ghazalat’s operator, North Petroleum, and the Egyptian authorities. The company will be subject to typical oil and gas exploration and development risks. There is no guarantee the company will be able to define economically viable resources.